When I started in graduate school, I was very interested in 3-manifolds, especially Thurston’s geometrization conjecture. Somehow in dimension 3, there is a marvelous marriage of flexibility and rigidity: generic 3-manifolds are flexible enough to admit hyperbolic structures — i.e. Riemannian metrics of constant curvature -1, modeled on hyperbolic space. But these structures are so rigid that they are determined up to isometry (!) entirely by the fundamental group of the manifold, and provide a bridge from topology to the rigid world of number fields and arithmetic. 3-manifolds, especially the hyperbolic ones, display an astonishing range of interesting phenomena, so that even though the individual manifolds are discrete and rigid, they come in infinite families parameterized by Dehn surgery. When Perelman proved Thurston’s conjecture, I gradually moved away from 3-manifold topology into some neighboring fields such as dynamics and geometric group theory; subjectively this move felt to me like a transition from a baroque world of highly intricate, finely tuned and beautiful objects to more rough and disordered domains in which the rule was chaos and disorder, and where one had to restrict attention and focus to find the kinds of structured objects that one can say something about mathematically. In these new domains my familiarity with 3-manifold topology was always extremely useful to me, but almost always as a source of inspiration or analogy or example, rather than that some specific theorem about 3-manifolds could be used to say something about groups in general, or dynamical systems in general, or whatever. Many important recent developments in geometric group theory are generalizations of geometric ideas which were first identified or studied in the world of 3-manifolds; but there was not much connection at the deepest level, at least as far as I could see. This impression was dramatically shaken by Agol’s proof of the virtual Haken conjecture and virtual fibration conjectures in 3-manifold topology by an argument which depends for one of its key ingredients on the theory of non-positively curved cube complexes — a subject in geometric and combinatorial group theory which, while inspired by key examples in low-dimensions (especially surfaces in the hands of Scott, and graphs in the hands of Stallings), is definitely a high-dimensional theory with no obvious relations to manifolds at all. Even so, the transfer of information in this case is still from the “broad” world of group theory to the “special” world of 3-manifolds. It shows that 3-manifold topology is even richer than hitherto suspected, but it does not contradict the idea that the beautiful edifice of 3-manifold topology is an exceptional corner in the vast unstructured world of geometry. Geometric group theory was born in low-dimensional topology, in the collective visions of Klein, Poincaré and Dehn. Stallings used key ideas from 3-manifold topology (Dehn’s lemma, the sphere theorem) to prove theorems about free groups, and as a model for how to think about groups geometrically in general. The pillars of modern geometric group theory — (relatively) hyperbolic groups and hyperbolic Dehn filling, NPC cube complexes and their relations to LERF, the theory of JSJ splittings of groups and the structure of limit groups — all have their origins in the geometric and topological theory of 2- and 3-manifolds. Despite these substantial and deep connections, the role of 3-manifolds in the larger world of group theory has been mainly to serve as a source of examples — of specific groups, and of rich and important phenomena and structure. Surfaces (especially Riemann surfaces) arise naturally throughout all of mathematics (and throughout science more generally), and are as ubiquitous as the complex numbers. But the conventional view is surely that 3-manifolds per se do not spontaneously arise in other areas of geometry (or mathematics more broadly) amongst the generic objects of study. We challenge this conventional view: 3-manifolds are everywhere. The generic objects that we discuss in the paper are random groups, in the sense of Gromov. In fact, there are two models of random groups that one usually encounters in geometric group theory. First, fix a finite number k (at least 2) of generators , and a length n; and then throw in random relations all reduced words of length n in the generators and their inverses, chosen randomly and independently from amongst all possible words of that length. The two models are distinguished by how the number of relators (i.e. ) depends on the length n. In the few relators model, one takes to be a fixed (positive!) constant. In the density model, one fixes a constant D between 0 and 1, and lets . The point is that there are approximately possible reduced words of length n to add as relators (each successive letter of a random word could be any generator or its inverse except for the inverse of the previous letter) and we are choosing to throw in a fixed multiplicative density of these words. Suppose we are interested in some property of a group; for instance, that it should be infinite, or torsion-free, or abelian, or whatever. For each fixed n, we get a probability law on groups, and we can ask what the probability is that our random group (with relators of length n) has the desired property. Then one takes n to infinity and looks at the way in which the probability behaves; usually we are interested in properties for which the probability goes to 1 as n goes to infinity. We say then that a random group has the desired property with overwhelming probability. Gromov showed that there is a natural phase transition in the behavior of random groups; at any fixed density D bigger than 1/2, a random group is either trivial or isomorphic to , with overwhelming probability. Conversely, at any fixed density less than 1/2, a random group is infinite, torsion-free, hyperbolic, and 2-dimensional. Since the group is 2-dimensional and hyperbolic, the boundary is 1-dimensional. Dahmani-Guirardel-Przytycki show that the boundary is a Menger sponge with overwhelming probability — i.e. the universal compact 1-dimensional topological space that every other 1-dimensional compact topological space embeds into it (one should say “metrizable” to be really rigorous here). So in one sense, we know what the “generic” objects look like amongst finitely generated groups. But in another sense, the answer is unsatisfying — these groups are unfamiliar, and not obviously related to the sorts of groups that we understand well, like free groups, surface groups, matrix groups, and so on. So it becomes important to try to understand the structure of subgroups of random groups; do they contain subgroups that are familiar, which we can use as key structural elements to understand the big group? and is this subgroup structure rich enough that we can hope to find similar structure in all hyperbolic groups? In order to make progress, we must first be clear about what sorts of subgroups we are looking for. We are interested in our groups not only as algebraic objects, but as geometric objects (with respect to some choice of word metric), and it is important to look for subgroups whose intrinsic and extrinsic geometry are uniformly comparable, so that the geometry of the subgroup (which we understand) tells us something about the geometry of the ambient group (which we want to understand). Since the random group G is hyperbolic, this means looking for subgroups H which are quasiconvex. Such groups are themselves necessarily hyperbolic, and the boundary of a quasiconvex subgroup H embeds in the boundary of G. Since the boundary of G is (topologically) 1-dimensional, the same is true of H, so we are led to the natural question: what hyperbolic groups have 1-dimensional boundary? a Menger sponge; this is the boundary of the random group itself! 3-Manifolds Everywhere Theorem: A random group, either in the few relators model or in the density model at any density less than 1/2, contains many quasiconvex subgroups isomorphic to the fundamental group of a compact hyperbolic 3-manifold with totally geodesic boundary. The proof is direct — we basically show that one can directly construct a map from such a 3-manifold group into a random group (given by a random presentation) in such a way that it is very likely to be quasiconvex and injective. The argument borrows very heavily from many parts of my earlier paper with Alden, although the construction step is much more complicated. It is possible to say something in general terms about the combinatorial construction. Our random presentation can be realized in geometric terms by building a 2-dimensional complex K, whose 1-skeleton X is a wedge of k circles (one for each generator), to which we attach disks along loops corresponding to the relators. Let r be one such relator; it is a long (cyclic) reduced word in the generators and their inverses. We can think of this word as being written along the edges of a circle L subdivided into intervals, with one letter in each interval. Imagine taking this circle and gluing it up to itself, matching sets of edges with the same label, so that the result is a labeled graph Z. If we then attach a disk along the boundary of the circle, we get a 2-complex M(Z), and this 2-complex immerses in K. If we are careful, we can arrange for M(Z) to have the homotopy type of a 3-manifold with boundary; and if the manifold is acylindrical and freely indecomposable with infinite fundamental group, it is the fundamental group of a compact hyperbolic 3-manifold with totally geodesic boundary. This idea of first performing a random matching which is “almost” right, which can then be adjusted at the cost of perturbing the distribution of an almost equidistributed “sea” of predictable pieces of bounded size, so that the rest of the matching decouples into a massive number of matching problems of uniformly bounded size that can be solved once and for all — is one that has come up in several places recently, including in the papers of Kahn-Markovic and my paper with Alden mentioned above, but also in Peter Keevash’s construction of General Steiner Systems and Designs (a paper I learned of from Gil Kalai’s blog). This is an idea with remarkable power and potential, beyond the already impressive (but well-known) power of “random constructions”. And it shows that highly constrained and beautiful combinatorial and geometric objects — designs as well as 3-manifolds — can be built out of generic pieces. I am not sure what the moral of the story is; perhaps in every corner of the geometric desert, beautiful flowers bloom. This entry was posted in 3-manifolds, Groups, Hyperbolic geometry and tagged 3-manifolds, acylindrical, quasiconvex group, Random groups, Sierpinski carpet. Bookmark the permalink. Over my career as an applied mathematician I have acquired many pure maths books (my hobby). One that I have bought recently is called the Wild World of 4-manifolds by Scorpan. It is relatively modern and seems to be packed with interconnections between many branches of pure maths. I had some postgraduate experience of these things before embarking on my (other) career and in the light of your apparent view of 3-manifolds and the way you say you moved away from studying them to some extent after the Poincare conjecture was proved, and also it seems your slight disinterest in algebraic topology that I read elsewhere, I wondered what you think of the study of 4-manifolds? – or is pure maths so vast that chance now plays a big role in what one ends up specialising in? I hope this question is not too broad or vague. – I have been looking for some entry point that is not too specialised but gives a good overview of where ‘important’ current research areas are and where they may be going…..
My post – grad background is differential geometry and algebraic topology – I have to admit that in the 70’s when I studied it, AG made more of a profound impression on me…(I also very much like number theory and have been trying to learn some basic algebraic geometry – Atiyah Macdonald etc. Sorry, in my last paragraph above I meant ‘AT’ not ‘AG’. Dear Paul – 4-manifolds is a vast world, and it makes a very big difference whether you study them in the topological versus the smooth category. I think Scorpan’s book is great, by the way, successfully communicating much of the excitement of the subject. But one very substantial difference between 3 and 4 dimensions is that in 3 dimensions it is fair to say that we know “a lot”: it is hard to come up with interesting questions about 3-manifolds that we can’t already answer. Whereas in 4 dimensions we don’t even have good conjectures about the basic objects. The most recent interesting paper on 4-manifolds that I read (well, skimmed) was http://arxiv.org/abs/1602.01687 by Cliff Taubes, where he gives examples of (families of) 4-manifolds for which certain families of anti-self dual metrics have “limits” of the form (S^3-K)xS^1 with a product metric, where K is a knot in the 3-sphere, and where S^3-K has its hyperbolic metric (so that the product is therefore conformally flat, and so trivially anti-self dual). This is a kind of connection between the 4 and 3 dimensional worlds that looks extremely important to me, but I have nothing nontrivial to add beyond that. 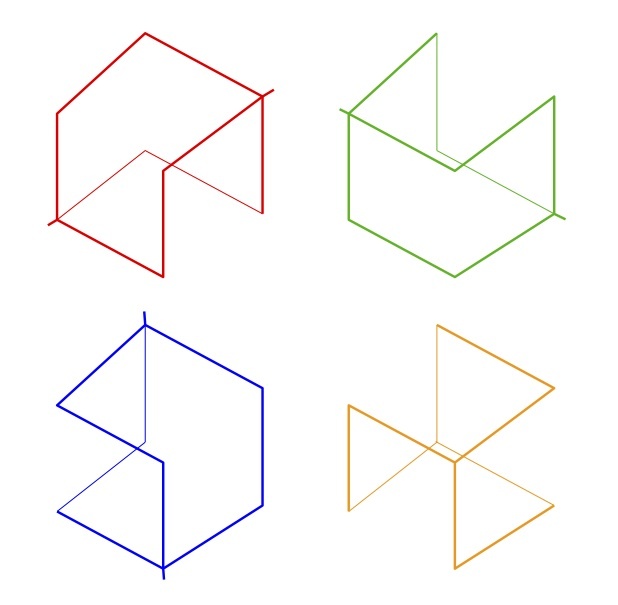 Would it then (in your opinion) be true to say that subject of manifolds of dimension 4 is essentially the most mysterious and most profound in all of geometry? I note that at the end of Scorpan, the Fintushel-Stern conjecture states that K3(k’) and K3(k”) are diffeomorphic iff k’ and k” are equivalent knots (modulo reflections?) and that possibly all of the complexity of knot theory is contained in 4-manifold topology. Maybe this relates a little to the paper you recommend (?). I agree with you in that I like the style and broad sweep of the book. In it Scorpan also recommends a nice AT book called Algebraic Topology by Hatcher that clarifies a lot that I had previously found explained too cryptically in say the (original) book by Greenberg – and which is also much broader in scope than the latter. Thanks for your recommendation of the Taubes 2016 paper and your perspective on this subject. I don’t think I’d ever claim anything like that. Can you then give an example from geometry (or maths in general) that is (in your opinion) more mysterious or more profound? Hi Paul. No I can’t. I don’t think it makes sense to “rank” things that way, and the whole question is hopelessly subjective anyway. OK, I take your point. It was an unfair question. I was just looking for your opinion of the most worthy area of pure maths to look at that would have most repercussions in the future. I suppose that that is an impossible question for anyone to answer. Thanks for promoting the Taubes paper (and also for writing the other posts on this blog site). I look forward to investigating further!